How lucky is Len Graham! He has spent much of his adult life in the company, and under the tutelage, of a humble but great man who led him deep into the music that so drove both of them. Now he has worked very hard at building that luck into an exhaustive, loving, accessible archive of the life and work of Joe Holmes (1906-1978), the great Antrim singer and fiddle player. In 1963, Len Graham aged 19, sang one of his own family songs, The Murlough Shore, at a fiddlers' gathering. Joe Holmes heard the song, which he remembered his grandmother singing, and asked Len to bring him the words at his home in Killeyramer, Co Antrim. Len delivered the song and started a friendship that lasted until Joe's death in 1978. The book which chronicles this friendship is a true gift to the various communities of Northern Ireland, Ireland, and Great Britain; these communities are of musicians, singers, oral history enthusiasts, and many more. 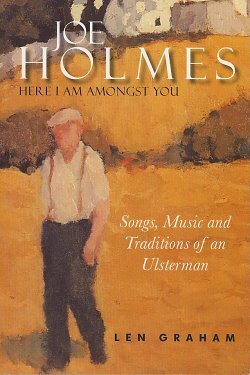 The book, Joe Holmes: Here I Am Amongst You, is set out in three distinct sections - The Songs, Fiddle Playing and Dancing and Other Traditions, with carefully set out appendices and detailed Notes. The Songs, with music and anecdotes, takes up by far the greater part. Every one of the songs has an interesting and often funny anecdote which brings the man and the community to life. There is of course an interesting and informative Introduction which gave me lots of information about Joe Holmes' home town, his schooldays, work, family life and history, and of course, his music. For me, there were two particularly interesting facts which seem to link him to the 'folk' world we inhabit. This was also true of Norma Waterson - the singing, not the fiddle playing! This was also true of Scan Tester who was given a fiddle and encouragement from his brother and they played together on Brighton seafront for money! These points interested me, particularly, but the book is full of interesting little snippets which show time and again how closely we musicians and enthusiasts alike are tied. I have noted in many years of travelling to the six counties that people are reluctant to speak of the factional/religious divides which cause so much devastation in that beautiful country. It could be that the inhabitants don't wish to impart their misery to outsiders and thereby increase it, it could be that they feel 'least said, soonest mended', we could all find different reasons for not shouting about the differences, but there is almost no hint of any dissent, and certainly no dissenters, in this book. Far from it, what Len Graham does is to name every singer/musician who came into Joe Holmes' sphere, and often to tell a nice little story of them. He notes how strong is the need for the 'continuity of the folk memory', and likens his poor recording equipment to a remark made to him by John Doherty, the great Donegal fiddler, "I have always been blessed with a bad fiddle!" (p.19) This is also true of those of us who were not blessed with a beautiful voice - you have to work that bit harder. There is very little to criticise in this book, but the most obvious is that there is no CD to accompany it. However, he does promise that he intends to make all of the songs and tunes in the book available in the future - let's hope it's not too long. As well as all the instruction, friendship and music Joe gave to Len, there was in reality a great deal of payback in the introductions Len managed to bring about, and the wide range of people and experiences he opened up to his mentor. Different styles are remarked upon, for instance Len Graham talks of Joe Holmes singing John Reilly the Sailor with his two nieces; 'This song came from them and Joe said the singing in unison of the McCloskey sisters was a real treat.' (p.112) I well remember Frank Harte telling me that harmony singing was a British habit and that the Irish way was to sing in unison. However, Len Graham tells us that that glorious harmony trio, The Voice Squad, sing Joe Holmes' songs (p.13), but also that they 'based their musical inspiration and harmonies on The Coppers' (p30). We are of course well aware that the songs of the British Isles are the property of all of us; Tumbling Through the Hay is a song Joe got from his mother, and Len Graham notes is close relationship to, and important difference from The Coppers' Pleasant Month of May (p.222); Brian O'Lynn is another song Joe got from his mother, but there are very similar versions with the first line 'Brian O'Lynn was a Scotchman born' and the Revd Baring Gould published the following 'Tommy A'Lyyn was a Dutchman born' and of course there is a nineteenth century version from Philadelphia. Len Graham even notes that it found its way into Joyce's Finnegan's Wake. Here you will find a wide range of songs; songs of love, soldiers, class struggle, exile, there is the Scots 'Corncrake Among the Whinny Knowes', which was one of his mother's favourite songs, songs of working women: The Factory Girl from Geordie Hanna and his sister, Sarah Ann O'Neill, The Flowering Trade with an anecdote from Packie Byrne (p.88). Len Graham heard Eddie Butcher singing the lovely Laurel Hill on a radio programme. He immediately drove to Magilligan and knocked on Eddie Butcher's front door. Of course, at the end of ensuing night's singing, Len asked if he might bring a friend along; the friend was Joe Holmes and Eddie Butcher became fast friends with the two of them. One night he was singing Laurel Hill, and Joe sang another verse to a different air - and hence another convoluted song trail was started. It also seems that everyone gets namechecked - not just Micil Quinn, that wonderful Mullaghbawn singer and storyteller, but his father, John 'Ned' Quinn, who would walk fifty miles to Skerries to work on the Co Dublin harvests. The harvest workers came from 'all arts and parts of Ireland', enabling John 'Ned' to return home with two wedding songs, The Wedding of Larry Magee and The Wedding Above in Glencree. This book is absolutely full of stories such as this, and they are so engaging that they are sometimes more interesting than the songs they illustrate. The Fiddle Playing and Dancing section is much shorter, but nonetheless there are 53 fiddle tunes, and information about the North Antrim fiddle tradition. In the section called Other Traditions there are tales of The Killyramer Christmas Rhymers and Mummers who seem to perform much the same play as that seen in England with the added character of Oliver Cromwell. The costumes are similar to those of the Straw Boys' plays from south of the border, and some of the text seems similar to that included in the play At the Black Pig's Dyke which I was fortunate enough to have seen at the Tricycle Theatre, Kilburn, some years ago. The book documents the contents delightfully, with illustrations from old chapbooks, and beautiful photos of some of his informants. Len Graham has brought together a most fitting, loving tribute to Joe Holmes, and I can't wait to hear the CDs which I hope will follow it.